Time for a five-second test. How many people in your church are hard-of-hearing? Time’s up. You probably don’t know and that’s okay. There’s a notable percentage of the congregation, especially among those over fifty, who have some level of difficulty hearing. Whether it’s not being able to hear sounds unless they’re loud, or things sound muffled, or any number of other hearing impairments, chances are there’s at least 5% of your congregation with some type of hearing problem. Common treatment for hearing impairment is a hearing aid and it used to be easy to identify these users. They’d have something that stuck out behind their ear or they had what looked like a custom-molded in-ear monitor, both obvious to see. Now, with the advancement of micro circuitry, most hearing aids fit deep into the ear canal or are so small that you can’t see them without sticking your eyeball close enough to risk getting smacked upside the head! The sound tech, people like you and me, need to consider how we can help people with hearing problems. One solution could be to turn the volume up (all about the bass, all about the bass, baddum-dum). 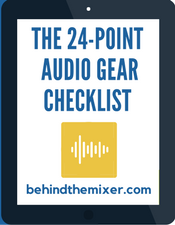 However, chances are you certainly won’t endear your church to those folks who wear a hearing aid because, just like audio systems are tuned for a room, hearing aids are tuned to provide clarity in the speech frequency range. So guess what? Anything that gets amplified overall, will certainly affect them substantially in that midrange frequency field more than someone without hearing loss. This is why it’s better for the church to invest in an assisted listening system. There used to be only two types of assisted listening device solutions, neither of which are cheap. One was an FM transmitter with multiple wireless packs that people could borrow. The other was the hearing-loop system. Most churches that I’ve worked with usually have one of the FM systems from Listen Technologies. It’s easy to set up and easy to use. All that’s required is a feed from your audio mixer of what you want going to the assisted listening devices. That feed goes into the FM transmitter. This is transmitted to the individual receivers. This system does require a check-in and check-out station for the receivers but there is a down side; they’re small (easy to lose) and more than one has taken a dunk in the restroom facilities. More involved, though common in Europe, is the hearing loop system and in its most basic form consists of an interface box that takes a signal from the audio mixer, and then, instead of transmitting the signal wirelessly, transmits the signal through a closed induction loop of wire. So what’s involved in implementing this type of system is to determine a place to run the induction loop wire, how much of your building you want to cover with the induction loop, and how big a transmitter you need to cover the area. As long as the hearing impaired person has a hearing aid with a T-Coil (most hearing aids do unless really old) then their hearing aid will pick up the signal from the hearing loop. They don’t have to do a thing. It’s a passive device as far as users are concerned. If you check out the Listen Technologies website, https://www.listentech.com/, you’ll see a few more options. For example, there are now smartphone systems that utilize Wi-Fi to transmit the signal. 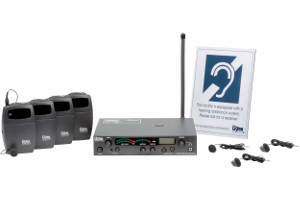 The hearing loop systems have now gone digital with Dante interfaces. There are IR-based systems and something called iDSP RF systems. Making it easy for the hearing impaired to enjoy church reaps benefits for everyone involved. If you’re starting a building project and want the most seamless way to help out your hard-of-hearing folks then implement a hearing loop system. Just remember that you’ll need to take into account how big an area you’re going to want to cover. If you want a lot of flexibility look at some of the FM, IR or RF models. You should educate yourself on what’s out there and what the different systems offer. Check out the below web sites for more information on assisted hearing systems. My church has people that do sign language. I’m sure it’s tiresome for them and possibly embarrassing for the people who are in the section for hearing impaired. I think ill turn the pastor to this and see what he thinks. A couple of pointers for those considering a hearing aid loop – this works by creating a magnetic field, so electric guitars pick-ups etc will pick up the the loop transmission and can result in feedback! This can be overcome by careful design of the loop to reduce loop signal strength in the stage area. We also only send the spoken word to the hearing loop amp (from mixer matrix or group output). We also have overhead power lines along one side of the church, and although the local electricity company has been helpful in minimising the magnetic field from the lines, this results in a background buzz on hearing aids using the T-position.